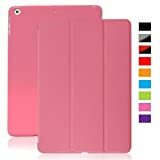 Give and amazing look to your iPad Mini with this amazing case. All jacks, ports and buttons are accessible without removing case. Multiple Viewing Angle at 35 and 65 Degree. KHOMO® is a registered trademark and best-seller of iPad cases. KHOMO® DUAL CaseKHOMO Introduces its best seller case for Apple iPad Mini. 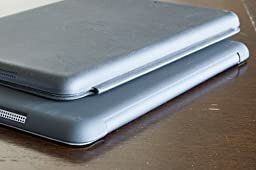 he new KHOMO DUAL Case is the perfect choice for those who want a stylish and affordable way to protect their tablet. This case uses a Polyurethane FRONT cover PLUS it also has a hard rubberized poly-carbonate BACK Protector. 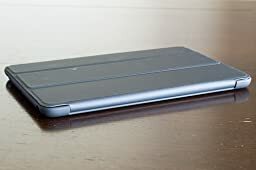 This case is ULTRA SLIM and is thin enough to match the thinness of the iPad Mini. I bought this case to replace my Apple case of the same basic design. I am absolutely delighted with this new case! My iPad mini Retina was literally falling out of the Apple case since the leather loosened over time. 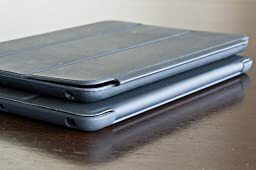 The Khomo case snaps over the edges of the iPad and holds it securely, while the apple case had relied on the corners holding it. The fit is tight and absolutely perfect. I really like the hinge design. The apple case had a pinched leather hinge which always poked my hand and never let the cover lay flat when closed. This hinge wraps around the side and looks, feels, and works much better than the Apple case’s. Even without the extra magnet the apple case has to “hold” the cover in a triangle position for standing it up, this cover works better and stays up with no issues due to the hinge center being much further back. Overall a great purchase and highly recommended. 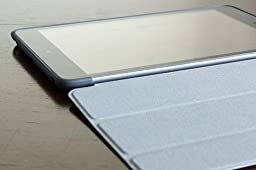 Searching out mini covers, for me it came down to the Poetic Slim Line and the KHOMO Super Slim. They’re both basically the same design, but I ordered the Poetic first, as it had a Green color that I liked. I ended up returning it because the Poetic came with a funky rotten fish like smell to it, that even after letting it air out for a couple of days, it didn’t go away. So I ordered the KHOMO and have been very pleased with it. I like that the KHOMO cover goes all the way around, protecting both the front and back of the mini. Apple apparently doesn’t have a companion case available for the mini to go with their Smart Cover. But that’s what I love about this case, is that the front and back are attached so the Smart Cover doesn’t come off. 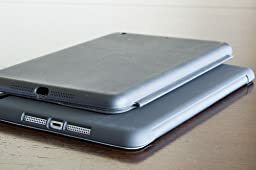 My hubby had an Apple Smart Cover on his iPad 2, and while they’re nice, in less than a year he had trouble with it falling off…almost like the magnetic connector was losing some of it’s magnetism. The case fits nice and snug on the mini. All the cut outs for the buttons, charge port, speakers, camera and mic are nicely cut out and have plenty of room. They don’t cover anything or make it hard to get to or use. The Smart Cover is stiff, of course being new, but it only took about one week of daily use to get it broken in. At first, there was a gap between the cover and the screen (on the left side closer to where the cover attaches to the back case) when the cover was closed and it concerned me a bit, but I’ve been using this case for about 3 weeks now and that gap is starting to go away. I folded and squished that piece between the cover and the back case a bunch and it’s helped to eliminate that little gap. The triangle fold works great! I haven’t had any problems with the triangle fold or standing the mini up on the triangle. The mini sits back on just enough of an angle that there’s no worry about it falling over. The wake/sleep function also works great! No problems there either. The case itself doesn’t seem to add a lot of weight to the mini either. At least not that I have noticed. It would be nice if there could be a few more color choices available for this case. I didn’t want just black and I didn’t like the light blue, so it came down to the orange or purple. I chose purple. I’ve noticed that they’ve added pink since I ordered my case, so I’m a little hopeful that maybe they’ll get a few more colors in. I would not hesitate to buy another cover if they do. A green or a different shade of blue would be nice. Ofher than that, I really don’t have anything negative to say about this case. I love my KHOMO CASE!! It’s a great alternative to Apple’s Smart Cover! Apple wants $39 for just a Smart Cover, and with this case you get full coverage for your mini with a cover that functions exactly as Apple’s does and for 1/3 the cost of Apple’s cover! I’m extremely picky when it comes to cases and screen protectors for my electronic devices and so I devote an ample amount of time debating between different products. I am a college student who’ll be using the iPad on a daily basis so I wanted something that was lightweight and durable. I usually am one to follow to flock so I tend to go with the most highly rated product there is. There were only 5 reviews (this being the 6th) when I purchased this product, but despite such little feedback, I decided to go and gamble my $12.99. 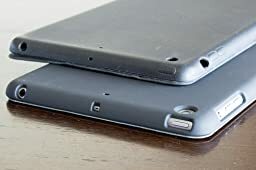 If you’re looking for a case that covers BOTH the front and the back of your iPad Mini, is consistent in coloring (meaning the case that holds the back is the same as the flap that covers the front – NOT black or white), adds absolutely no bulk to the streamlined device, holds it well, sleeps/wakes your iPad for you, and has the most precise holes for the speakers, volume dock, camera, etc. then look no further because this product is for you. 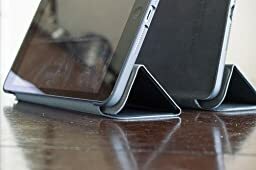 Apple has yet to come out with a smart case for the iPad Mini but you can get the same function and security for a lot less. Although it took a while for it to get shipped (I didn’t realize it was out of stock when I made the purchase), I am very satisfied with this product and I believe that this is definitely worth people’s money. © 2014 Welcome to What's an iPad.